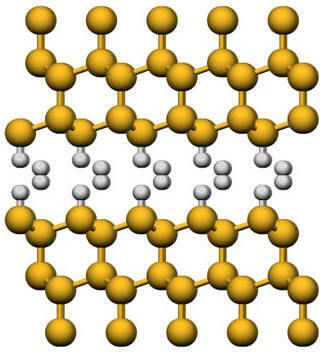 Description: Transfer a single crystal silicon layer onto a handle substrate at nanoscale thickness defined by sacrificial layer. Description: Transfer a single crystal silicon layer onto a handle substrate at nanoscale thickness by hydrogen diffusion without a high dose ion implant step. 【原理圖說】Inside of silicon, hydrogen can form H2 molecules, cover extended internal surfaces (called platelets) and stick to various other defects (including vacant sites, extra Si atoms and all manner of impurities). 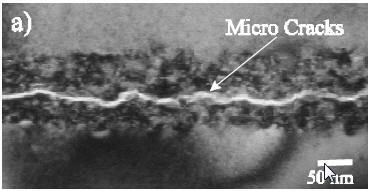 (111) hydrogen containing platelet in silicon. The space between the planes is filled with a high pressure phase of molecular hydrogen. Description: Transfer a single crystal silicon layer with thickness less than 30 nm onto a handle substrate by the diffusion of implanted hydrogen at sufficient low dose.